How important are truth-conditions for truth-conditional semantics? In this paper, I argue that while truth-conditional semantics in generative linguistics provides lots of good semantic explanations, truth-conditions do not play an important role in these explanations. That is, the fact that expressions have the particular truthconditional contents (extensions or intensions) they have does not even partly explain facts about semantic phenomena. Rather, explanations of semantic phenomena appeal to extra-truth-conditional properties attributed to expressions via their lexical entries. Focusing on recent truth-conditional work on gradable adjectives and degree modifiers by Kennedy and McNally (Language 81:345–381, 2005), I show that the best explanations of semantic anomaly and entailment for these expressions are non-truth-conditional—they do not depend on the fact that these expressions have the truth-conditional contents they have. I then provide reasons for thinking that the point generalizes beyond gradable adjectives and degree modifiers to other expressions, and beyond anomaly and entailment to other semantic phenomena. Truth-conditional content, generally, is extrasemantic. 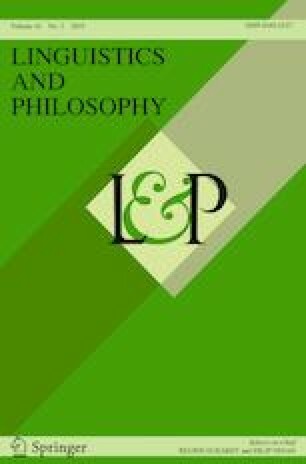 This paper has benefited greatly from the feedback of Lionel Shapiro, Zoltán Szabó, Kate Stanton, Yale’s ELLMM City Workgroup, the participants in the UConn Philosophy Department’s Brown Bag series, Aidan Gray, David Ripley, Bill Lycan, Jared Henderson, Junyeol Kim, and two anonymous reviewers. von Fintel, K., & Heim, I. (2011). Intensional semantics. Lecture notes, MIT. http://lingphil.mit.edu/papers/heim/fintel-heim-intensional.pdf.